Place the mayonnaise, lemon juice, garlic, mustard, chives, Tabasco, salt and pepper in a bowl and stir to combine. Add the prawns and toss to coat. 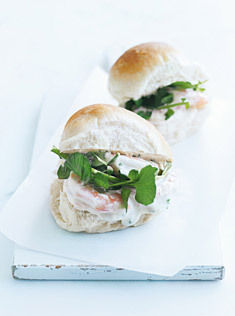 Split the rolls, fill with the prawn mixture and top with watercress sprigs to serve. Serves 2.